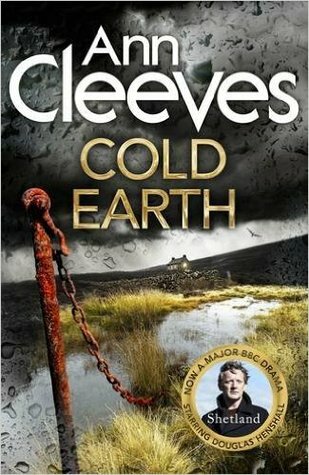 I loved the first 6 books in the Shetland series and Cold Earth is no exception. It works on all levels – a murder mystery to solve, with beautiful descriptions of the landscape, conveying a real sense of place, convincing characters with realistic dialogue, a well paced plot and above all a writing style that doesn’t intrude on the story, but leads you to keep on turning the pages from the beginning to the end. I featured this book in this My Friday post, quoting the opening sentence and a teaser from page 56. The dead woman’s identity puzzles everyone on the island, although one person must know who she is as among the things found in the debris left in the croft is an unsigned letter addressed to Alis saying what a joy it is to welcome her back to the island. Perez felt her exotic appearance and black hair and eyes could indicate that like him she was of Spanish descent. He and Sandy Wilson, his sergeant are joined by Chief Inspector Willow Reeves (originally from the Hebrides) from the Inverness team to head up the investigation. Perez is both troubled and distracted by her, but realises just how much he wants her to be in Shetland with him running the investigation. As usual Perez works very much on his own, but Sandy is gaining more confidence in his detecting skills and helped by Perez he makes a valuable contribution, as they eventually discover the identity of the dead woman, why she was on the island and why she was killed. If you haven’t read any of the Shetland books, but have seen the TV series, you’ll notice that there are some significant changes – notably in the characters of Cassie, Fran’s daughter who is still a child in the books but has grown up in the TV stories, and the relationship between her father, Duncan Hunter and Perez. And Douglas Henshall, who plays the part of Perez, is not physically like Jimmy Perez – Perez has long dark hair with Spanish ancestry in his blood, whereas Douglas Henshall is a redheaded Scot. Again, as with Vera, I was put off this series by the televised version. I should learn to read the books first and leave the t.v. alone. I’d read some of the Vera and Shetland books before they were adapted for TV and much prefer the books. It really irritates me when they change the plot and even go to the extent of changing the characters and in one episode (can’t remember which) they even changed the killer! Kay, no I didn’t know Ann Cleeves has a new series in the pipeline! How interesting – I wonder what it will be. If you find out do let me know. Margaret, the new book will be out in September and the title is THE LONG CALL (think that’s right). It’s a ‘Two Rivers’ mystery, whatever that means. I can’t find a description of it yet or a cover. Can’t wait! Thanks Kay! I’ve found that it is to be published by Minotaur Books in the UK – expected date 3 September. Goodreads has this description – ‘In North Devon, where two rivers converge and run into the sea, Detective Matthew Venn stands outside the church as his father’s funeral takes place. Once loved and cherished, the day Matthew left the strict evangelical community he grew up in, he lost his family too.